What a great Sabbath to wake up smiling. It is always good to have a bright Sabbath morning. We rolled into Alabama today and kept going. 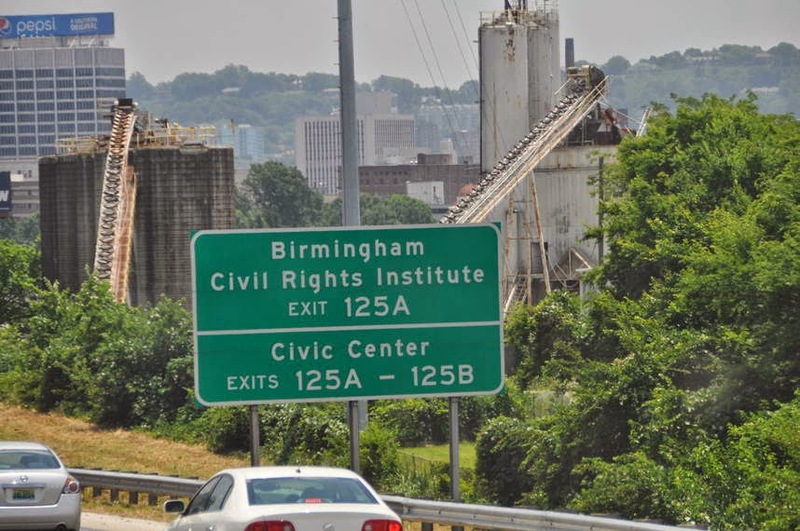 The city of Birmingham has been an interested to me since I love history. The Civil Rights Institute is located here. We saw one of the new buses in the city. I immediately thought about the bus strike in Montgomery, AL that was staged in 1955 as a result of Rosa Parks not being allowed to sit where she wanted to. Most people don't know the whole story as this issue started way back in 1943. Goggle the Montgomery Bus Boycott and you will get another whole perspective. 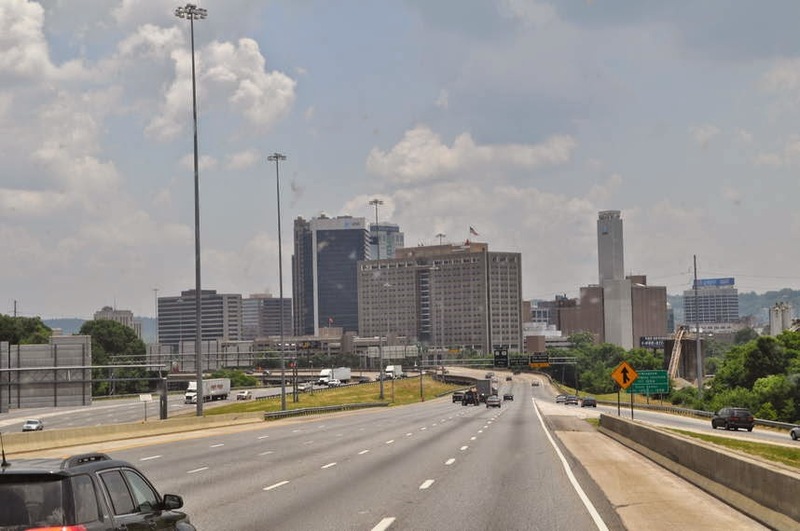 We ventured up to Atlanta, GA. 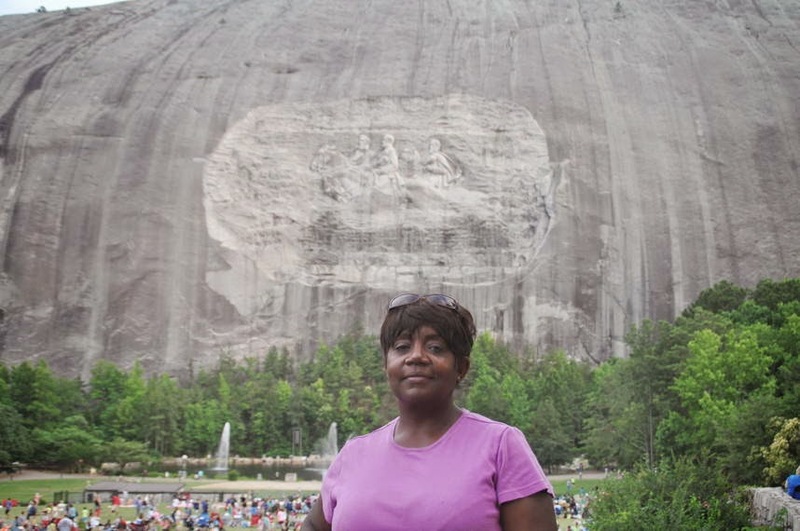 Somehow, on our Civil War tour last year we missed going to Stone Mountain. So I just wanted to venture to the site before we headed north. We are going to Fort Mills, South Carolina to stay with our family Charlene and Cairy Lester. As Charlene and I were texting she made me promise to stay for the night laser show. When I say it was worth it, trust me it was. 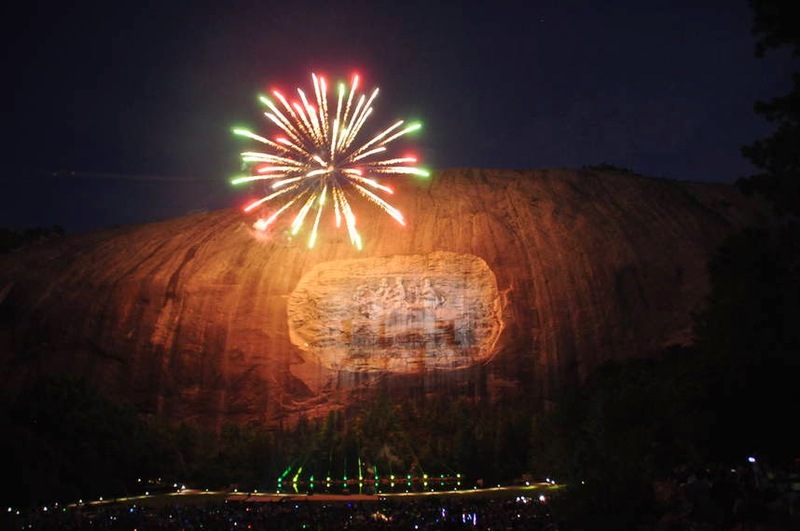 Stone Mountain is located just 16 miles north of Atlanta. It is suppose to be GA's 1# attraction. It only cost $10 per car load. What a deal. Charlene told us to get there early as the field fills up. The people make an evening of the event. There were bus loads of churches, family reunions, family outings, etc. This was almost like going to the Concord Pavilion for a jazz concert. People were picnicking, grilling like at home. There were more than 5,000 as the show began. There are tram rides and it is next door to a theme park. 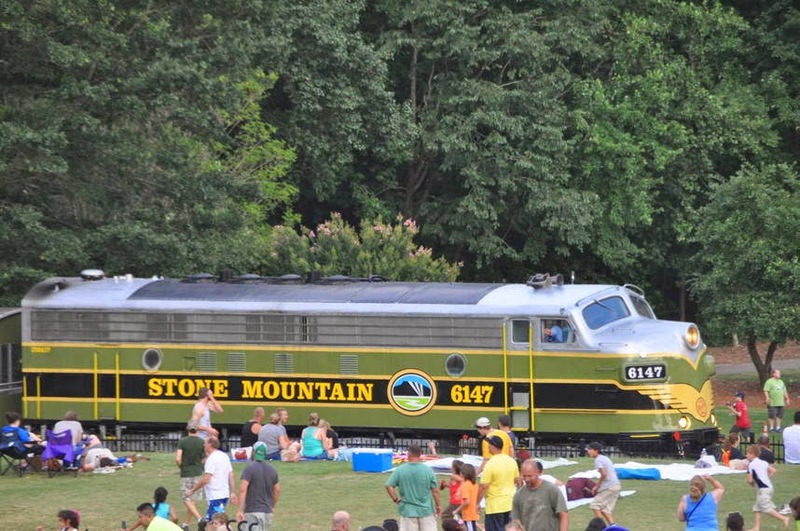 There were also a train ride that came right through center of the park. No it only looks like it is running over people. There is a fence on both sides. There was a couple who set next to us who struck up a conversation. OK. Dysfunctional families are not only in Cally. I will leave it at that. Of course we went to our Wal Mart hotel for the night. I decided to look up the origin of Stone Mountain. Now this was interesting. 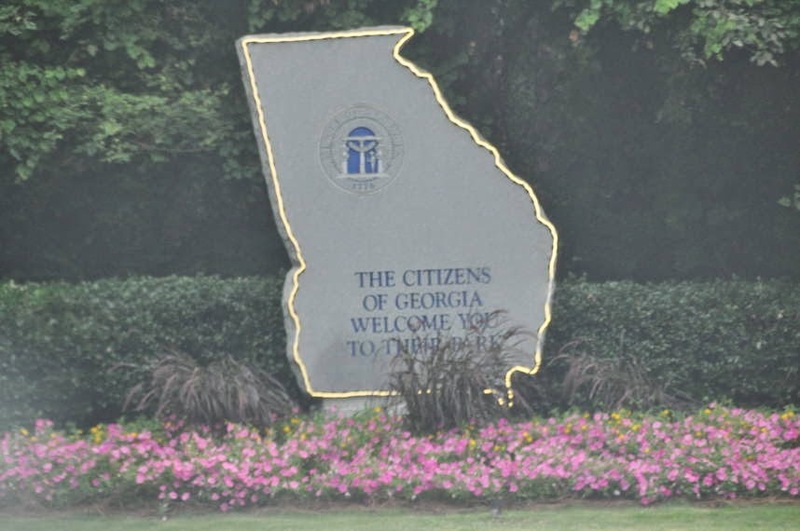 The idea was started by editor of the Atlanta Georgian newspaper. He thought it would be a good idea to have a memorial dedicated to Robert E. Lee. From there it when crazy. They tried to raise money with commemorative coin etc. That was a huge failure. They fired the designer of the sculpture, John Gutzon de la mothe Borglum (usually called Gutzon Borglum) because he took time to design the coin at the committee's request. He later went on to design Mt. Rushmore. The most interesting info I found out was the Klan, (yes the KKK) put up most of the money for the memorial. With the release of the horrific movie, Birth of the Nations, the Klan interest was growing and so the interest in the Confederacy causes in the south. You have to know that this was 50 years AFTER the Civil War. The South just never gives up. There is so much to this story that you have to look it up and get historicized. Now that would be a Tanita D. word. Whewww. I am scared. 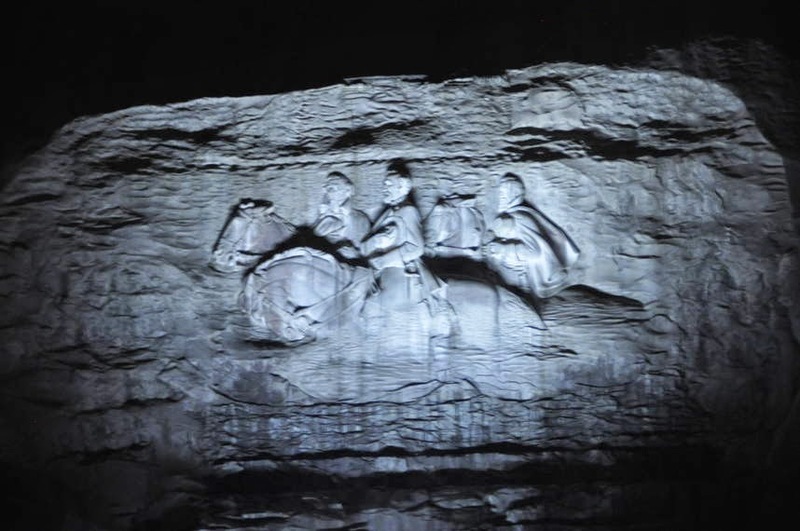 How long did it take to complete the memorial at Stone Mountain. Hum - - - well that depends on how you figure it. It began and stopped a few times. It started in 1923 but wasn't fully completed until 1972 but they have a ceremony in 1970. Wouldn't it just figure that the klan was in on that!? Ugh. And yet: those engineers who put in the first steel beams to create the platform that supported the workers as they chipped and carved into that stone? Were African American, all four of them. And, I'd bet that of those families sitting around, chilling and grilling (and being dysfunctional), many were AfAm, mixed, red, yellow, black and white. And this is how, in the words of the apostle Paul, to "...not be overcome by evil, but overcome evil with good."